Japan Offspring Fund has produced a documentary in order to change the situation in Japan, where antibiotic resistant bacteria are continuing to increase. Title: “Danger! Antibiotic Resistance – Untreatable Bacterial Infections – Why Antibiotics No Longer Work“. The video/DVD has two parts, with focus on medical use as well as the risks associated with food. Part 1 describes the actual conditions regarding multiresistant bacteria and health. In many hospitals, bacteria are increasingly becoming difficult to treat. We discuss what you can do to protect yourself and your children. Part 2 describes how food production is giving rise to antibiotic resistance, and the necessary solutions. We visit farms to show how meat can be produced without antibiotics. Alarming increase in the number of children suffering from antibiotic resistant bacteria: Many children easily catch ear infections. The treatment used to be simple: just a visit to the doctor and a prescription for antibiotics. But this is no longer always the case. The long and difficult suffering as a result of antibiotic resistant bacteria has become increasingly common.Our report describes the real experience of a patient with a serious infection. With computer graphics, we also explain exactly how resistant bacteria appear and develop. Community acquired infections, happening outside of hospitals, are increasingly a life-threatening problem: Antibiotic resistant bacteria started as a problem inside hospitals. Recently there is evidence about so-called community acquired infections, where children and others are infected outside hospitals as well.We describe the American case of 4 children who were infected and died from community acquired MRSA (Methicillin-resistant Staphylococcus A). This is also beginning to happen at nursery schools in Japan, according to a recent scientific study. How can you protect yourself from antibiotic resistant bacteria: So, how is it possible to protect yourself and your family from being exposed to antibiotic resistant bacteria? 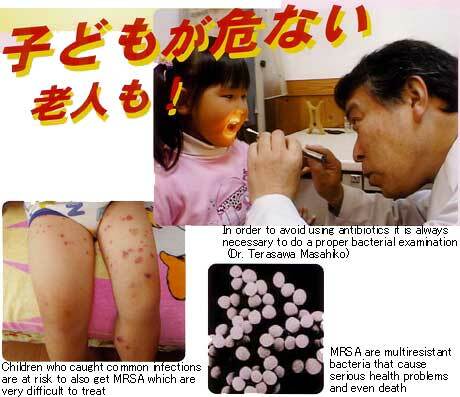 We have interviewed Dr. Terasawa Masahiko, whose advice is to stop the overuse of antibiotics. Rather, many infections should simply be left without prescribing antibiotics, as the children will quickly recover by themselves. Food production is giving rise to antibiotic resistant bacteria: People are actually dying from antibiotic resistant bacteria emerging from food production. In reality, much more antibiotics is used for animals than for humans. This means food production is a huge “culture factory” to produce bacteria that are resistant to antibiotics. We were able to bring a video camera to several farms, to show how antibiotics are actually used. In addition, we interviewed veterinarian Kogure Kazuo, who describes the problems of abuse of antibiotics on farms. How Sweden was able to prohibit the abuse of antibiotics: In Sweden, antibiotics as growth promoters for farm animals have been prohibited since 1985. Sweden has also managed to achieve a remarkable decline in the level resistance among bacteria. How was this possible? We went to Sweden to find out more about the secret of the Swedish success story. Introducing the Japanese pioneers: We introduce the pioneers in Japan, who are able to raise animals successfully without using antibiotics at all. We propose ways for increasing the number of such farmers, and what consumers can do to support their efforts. The documentary about antibiotic resistant bacteria, that 20 000 people die from every year in Japan, was released on January 20, 2005. 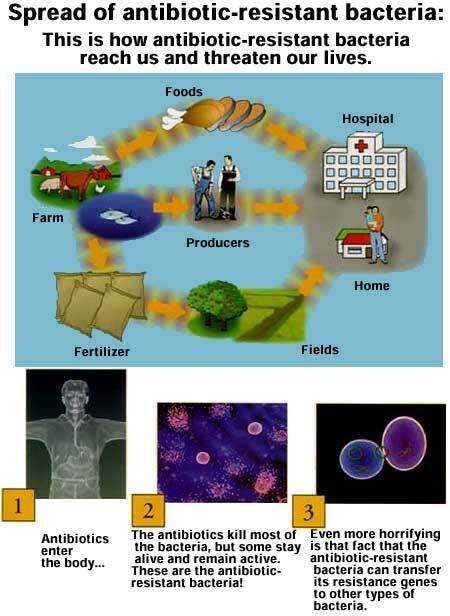 In September, 2004 the Food Safety Commission of the Japanese government has released a guideline for resistant bacteria, and is gradually moving towards making a regulation. We hope that this video can create opinion about the issue, in order to get a really strict regulation!